Update: LazenbyBrown work their magic to update our logo! Our jars now feature our updated logo include our Yonder Honey bee! Huge thanks to the team who always go the extra to product something wonderful! You may also notice that our new labels feature the Yorkshire Mark logo too as we’ve joined the Made in Yorkshire collective to celebrate locally produced excellent food and drink. 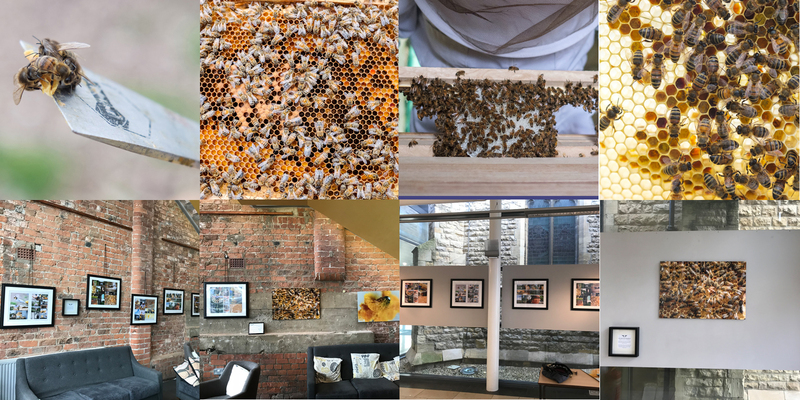 Jim Poyner’s documentary photography exhibition of the Yonder Honey bees has been touring York venues since October 2017. First shown at City Screen cinema in the cafe bar, the exhibition then moved to York Explore library, before moving to York St John University for the York Literature Festival to coincide with the launch of the Pollination Project Anthology (22 March 2018). The images show Yonder Honey hives from across York and in some more unusual locations being checked, moved, and honey being extracted. Jim Poyner shadowed us through the beekeeping months (March to Sept) throughout 2017 documenting how we work with our hives – and photographing everything whilst also wearing a full bee suit, veil and gauntlet gloves! We very much hope to keep the tour of this exhibition going, so if you would like to host it please do get in touch!